Front row: Judy Brady, Kristina Hosteller, Gary Lord, Marilyn Walker, Yvonne Thune, Denny Tripp, Judy Gardner. 2nd row: Ted Westby, Scott Dorr, Jean Carter, Bobby Torrence, Kenny Baker, ""Cookie"" Madsen, Billy-Marlene McCoy. 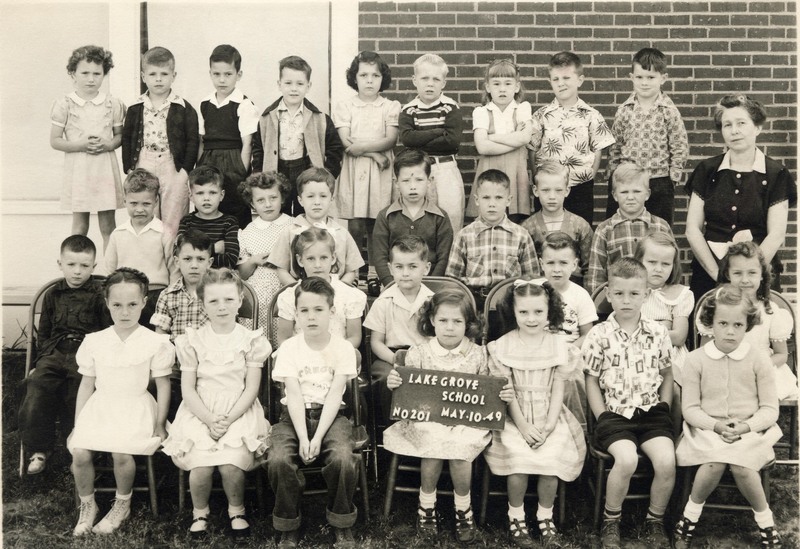 3rd row: Bobby McCaughern, Hunter Schmidt, Shirley Marston, Billy Davisson, Richard Barless, Bobby Burke, John Chandler, John Hedlund, Clara Hargreaves, teacher. Back row: Susan Warren, Walter Luse, John Dickerson, Ernie Anderson, Shiela O'Donnel, Courty Ofelt, Judy Ann Woodard, Pat Worsham, Craig Chisholm. Gift of Pat Baars 2-11-2008. Mr.& Mrs. J.B> McNeil, Commercial Photographers, 8623 S.E. 11th Ave., Portland, Oregon. Description [sign] Lake Grove School. No. 201. May 10,49. Gift from Pat Hargreaves Baars. Same as photo 1681. Transcription Front row: Judy Brady, Kristina Hosteller, Gary Lord, Marilyn Walker, Yvonne Thune, Denny Tripp, Judy Gardner. 2nd row: Ted Westby, Scott Dorr, Jean Carter, Bobby Torrence, Kenny Baker, ""Cookie"" Madsen, Billy-Marlene McCoy. 3rd row: Bobby McCaughern, Hunter Schmidt, Shirley Marston, Billy Davisson, Richard Barless, Bobby Burke, John Chandler, John Hedlund, Clara Hargreaves, teacher. Back row: Susan Warren, Walter Luse, John Dickerson, Ernie Anderson, Shiela O'Donnel, Courty Ofelt, Judy Ann Woodard, Pat Worsham, Craig Chisholm. Gift of Pat Baars 2-11-2008. Mr.& Mrs. J.B> McNeil, Commercial Photographers, 8623 S.E. 11th Ave., Portland, Oregon.